Gefen EXT-UHD600-18: Active 600Mhz HDMI 2.0a + Audio 1:2 Splitter featuring HDR (High-Dynamic-Range), HDCP 2.2, Dolby Atmso, DTS:X, and up to 4K UHD (4:4:4) resolution. 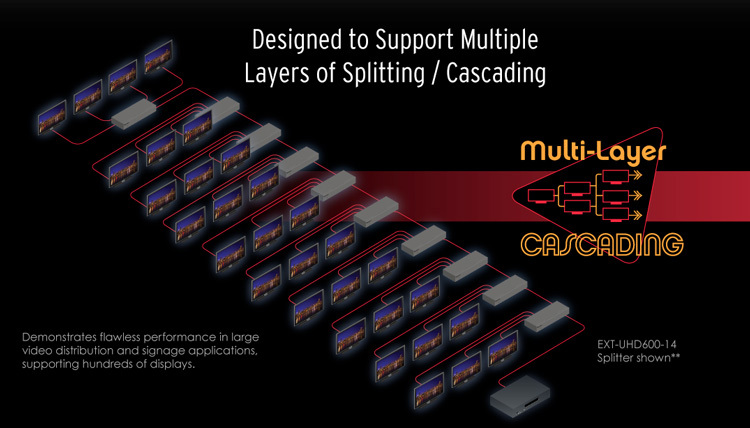 ** Actual cascading layer count is dependent on the robustness of the HDMI source output section and the HDMI display input section. HDR reduces cascading ability. Designing systems capable of distributing 4K Ultra High Definition media requires support for the content of today, and headroom for the content of tomorrow. Gefen's EXT-UHD600 Series of splitters take HDMI 2.0 to its highest specification of 4K 60 Hz at 4:4:4 chroma subsampling, along with HDR (High Dynamic Range) support. They go beyond the requirements of typical 4K systems, delivering stunning Ultra HD and DCI/Cinema picture up to 4096 x 2160 pixels at 60 frames per second without subsampling color. This ensures that the scene shown on the display is every bit as brilliant as the picture that the camera captured. HDR lets every subtle nuanced gradation of each pixel play out across the screen in immersive clarity. Gefen's EXT-UHD600 product line creates a seamless bridge between the digital media of yesterday, today, and tomorrow. 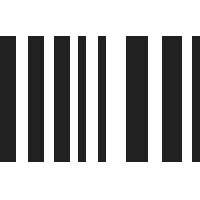 Supporting the digital rights management standard for Ultra High Definition content, HDCP 2.2, as well as the legacy HDCP 1.4, Gefen's EXT-UHD600 products can handle the signal routing needs for both existing and new components in commercial and residential AV systems. Highest performance multichannel digital audio including 7.1 channels of LPCM and HBR (High Bit Rate) digital audio formats such as Dolby Atmos�, Dolby� TrueHD, DTS:X, and DTS-HD Master Audio are also supported. These splitters have been specifically designed to support multiple layers of cascading** for flawless performance in large video distribution and signage applications, supporting up to hundreds of displays. Gefen's exclusive Long Reach Power (LRP) feature provides 5V at 500 mA (as opposed to HDMI standard 55 mA) on pin 18 of HDMI outputs 1 and 2. This enhanced current capability enables select extender devices to be powered through their HDMI input port without the need for an external power supply. 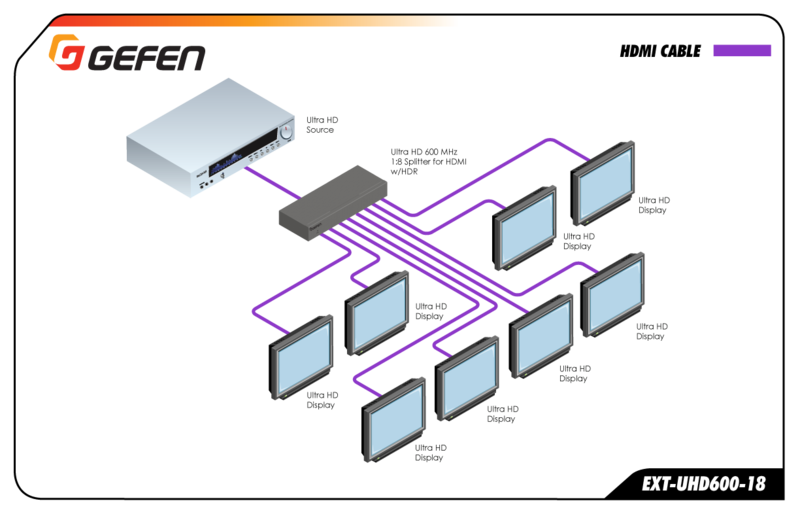 Gefen's EXT-UHD600 product line was designed to work with Gefen's Syner-G software suite. EDID and HDCP management, status monitoring, and firmware updates can be done in minutes using the Gefen Syner-G software. The Gefen EXT-UHD600-18 splitter features a 1U tall, rack-mountable enclosure that can also be placed on a shelf. It accommodates Gefen locking HDMI cables for secure connections.